In large bowl, stir cookie mix, eggs, butter and flour until dough forms. Divide dough into thirds. Tint one-third of dough with red food color, kneading until completely blended. Repeat with another one-third of dough and blue food color. Tint remaining one-third of dough with white food color. Wrap each portion of dough in plastic wrap; refrigerate 2 hours. Heat oven to 350°F. Spray 2 cookie sheets with cooking spray. Roll each color of dough into 26 (3/4-inch) balls. Shape each ball into 12-inch rope. Place 1 each of red, blue and white ropes together. Starting at 1 end, coil ropes to make 2 3/4-inch round cookie. Place 3 inches apart on cookie sheets. 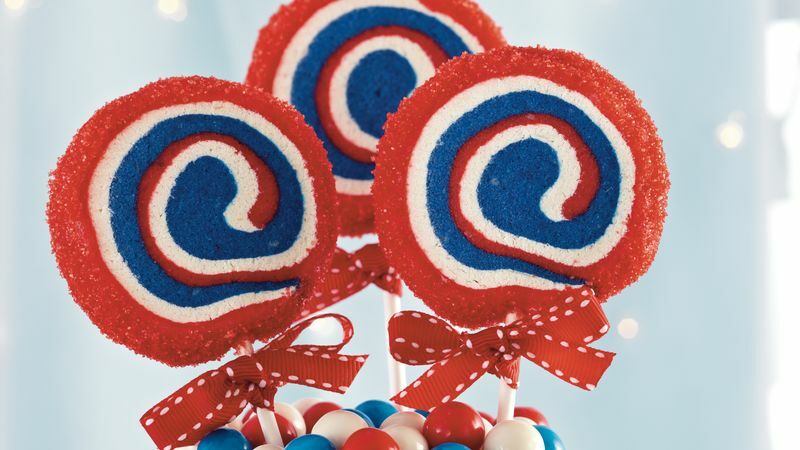 Insert 1 lollipop stick into bottom of each cookie. Bake 8 to 10 minutes or until bottoms are lightly golden. Cool 5 minutes; remove to cooling racks. Cool completely, about 30 minutes.